Lamar Park is a half-acre “pocket park” located in Hyde Park. With its tall trees, benches, and pathway, Lamar Park is a welcome green space for Hyde Park residents to enjoy throughout the year. In the middle of the park sits an open plaza, providing ample room for community gatherings. At the east end of the park sits the historic Dolphin foundations, once of the oldest operating fountains in the City of Houston. Lamar Park was named in honor of Mirabeau B. Lamar, the second President of the Republic of Texas, who owned the land in the 1840’s that is now known as Hyde Park. Hyde Park was annexed into the City of Houston in 1905-1906. Lamar Park has been long recognized as a feature of this neighborhood with its special jewel, the Dolphin Foundation. In the early 2000s, a group of dedicated Hyde Park residents recognized how critical green spaces were in an urban environment. Through the Hyde Park Civic Association, these residents undertook an enormous capital project to improve the park. Their efforts radically transformed the space, giving us a place to stroll through the park on a walking path, a central plaza for neighborhood gatherings, an irrigation system to maintain landscaping, and a place to sit and enjoy the park. Because of the tireless work and vision of those dedicated residents, we have a fully restored green space and operating park that is a source of neighborhood pride. 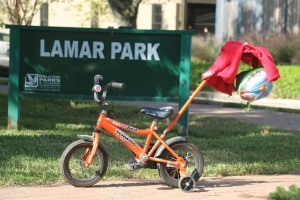 Lamar Park remains a vital green space for Hyde Park. Each and every day neighbors can be seen walking through the park, enjoying this hidden gem within our neighborhood. Each October, the Hyde Park Civic Association hosts the Annual National Night Out (NNO) Event in Lamar Park. With the generous support for various businesses and sponsors in the neighborhood, the event attendance averages over 150 Hyde Park residents each year. The NNO event provides an opportunity for neighbors to meet and great each other as well as spend a fun evening in the park. The Hyde Park Civic Association works collaboratively with the City of Houston Parks Department and the Houston Parks Board to maintain the park space and thd Dolphin Fountain. The Civic Association established the Lamar Park Committee to liaison with the Parks Department and Parks Board. 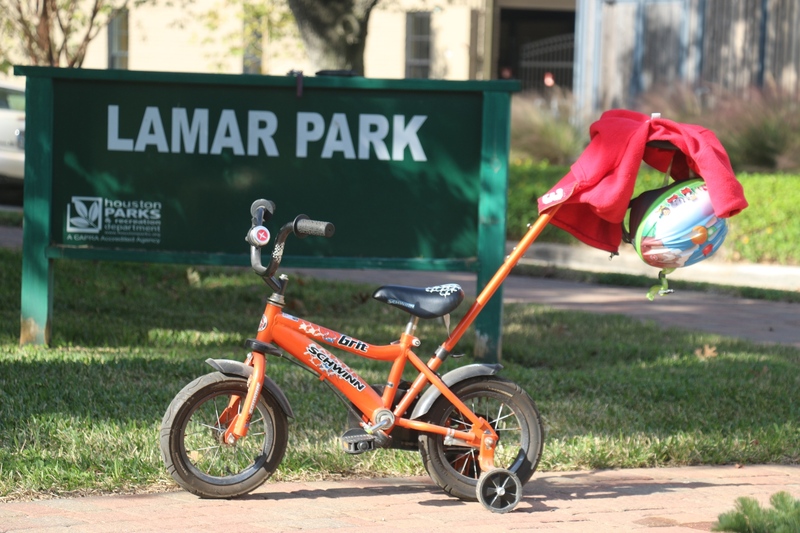 The Lamar Park Committee’s responsibilities include, among other things, monitoring the park, addressing park issues, and planning for additional capital improvement projects for the park. I LOVE GREEN SPACES! HOW CAN I SUPPORT LAMAR PARK? Give an additional donation (in addition to your membership fees) to help us with special projects for the park. Donate here. Pay your energy bill and help support Lamar Park. Learn more about the Hyde Park Civic Association partnership with Stream Energy through the PowerUp! Program, which helps raise funds for Lamar Park. Volunteer to serve on the Lamar Park Committee. There are a variety of roles on the Committee from park monitoring to planning and both short- and long-term projects. To volunteer, please email the Hyde Park Volunteer Coordinator at volunteer@hydeparkhouston.org. The Dolphin Fountain Restoration Project will be under the leadership of a future sub-committee. Stay tuned to the Hyde Park newsletter and website for more details. If you have any suggestions or concerns about Lamar Park, please email the Committee Chair at lamarpark@hydeparkhouston.org.